These words ring true when I think about the journey Leopard Mountain has taken. Like most new businesses, especially small family run businesses, it has taken a tremendous amount of dedication, resilience and courage to realise this dream and persevere, even through the tough times. To paint a picture, let’s take you back to the beginning where it all started! June 1997 saw the Vivier family begin their journey into the safari and conservation industry. With a sound business plan and true passion for the industry, the Vivier Family embarked on a ride that would one day result in one of the top Game Lodges in KwaZulu Natal… and what a journey it has been! Like most start ups, the beginning had its fair share of bumps in the road! Tragedy struck just three months after opening when the main lodge building was struck by lightning and burnt down in a matter of minutes. Undeterred, plans were quickly made to rebuild the lodge again. At that time, there were only five chalets and a handful of guests catered for by a team with little to no experience. But what they lacked in experience, was made up for in pride, enthusiasm and optimism. The adventure was well on its way! The small nature reserve that was Leopard Mountain boasted a variety of antelope, Leopard and smaller animals including an impressive diversity of bird species. Little did the family know that with in just a few years, through hard work and an unwavering passion for the industry, they would almost double their number of chalets and staff. Now with nine luxury chalets, a heavenly Spa and a team of 32 staff with over 100 years’ experience between them, the lodge accommodates guests from all over the world in their unique, relaxed style which keeps them coming back for more. 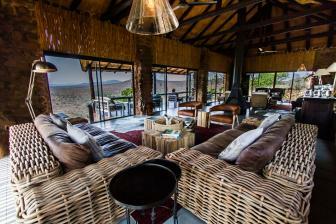 The lodge is currently undergoing an exciting upgrade, a new update that will preserve that relaxed, safari styled comfort with just a dash of modern class. 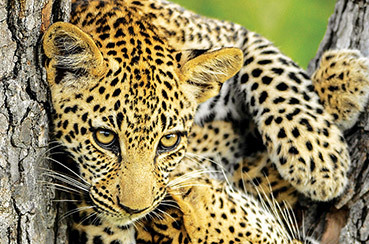 Guests at Leopard Mountain enjoy top class game drives through the 58 000 ACRE Zululand Rhino Reserve (ZRR) viewing the Big 5 (Rhino, Elephant, Lion, Leopard and Buffalo), Wild Dog, Cheetah and Hippo among others. While writing this, I am listening to the ZRR two-way radio feed with interest. The rangers are comparing who has the best Lion sighting – Ivor with his female Lion stalking a group of Kudu, or Alden following a female Lion, hoping she is going to show off her month old cubs. Sightings in the reserve have hit an all time high leaving guests mesmerised, especially after the influx of ‘the cute and the cuddly’ … yes, baby season has hit and the reserve now boast Elephant calves, Cheetah cubs, a Rhino calf and of course the Lions cubs among others. It is fair to say that the Vivier family has fulfilled their dream and more! And the good news is that it is far from over. The Leopard Mountain team are extremely excited for what the future has in store for this special place under the African sky.